Just when you finished getting use to the last wifi technology a new one is about to take over. 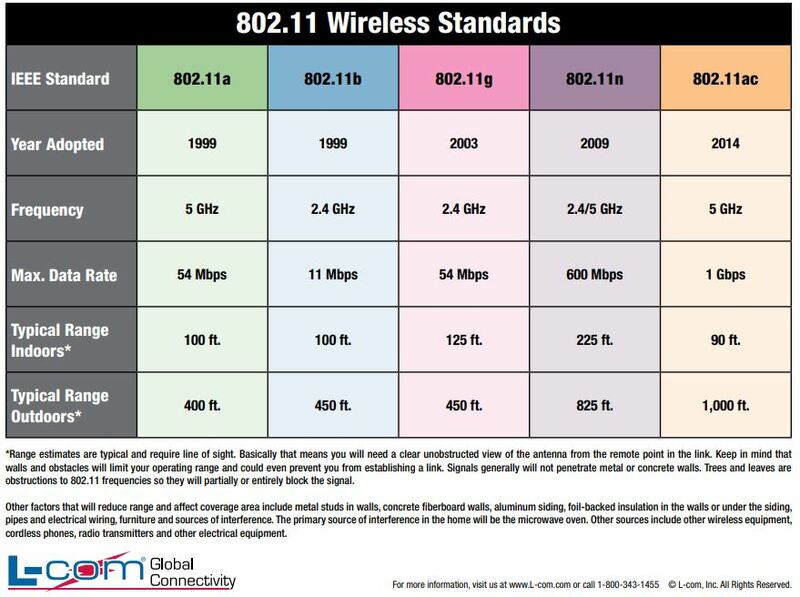 If you have a laptop or cell phone it’s currently using the 802.11ac (or older 802.11n) standard. In non tech terms these technologies determine the speed and range of your devices network connection. You can see how this has evolved over the years with the chart below. Now a new standard is about to breakout which will provide even more speed and range. Called 802.11ax it promises 4x the speed, improved performance in congested environments, better range, and battery life improvements for mobile devices. Some devices are already out using the draft specifications but we should see much more in Q1 of 2019 when everything is finalized and everywhere in 2020. Do I need to hold off on my wifi purchases? If you are consumer the simple answer is no. Having an 802.11ax device will not matter if the wireless network does not support it. If you are a SMB looking to upgrade from an older 802.11n wireless infrastructure the answer is also no. 802.11ac Wave 2 devices should do the trick. If you are a larger business with multiple wifi access points and a complex infrastructure then maybe. 802.11ax will see the most benefits in congested wireless environments such as cities or large office parks or where distances are greater (e.g., campus environments). If you can wait a year we would recommend waiting to upgrade when the standard is finalized, products are released, and the first firmware updates have been put out (fix those version 1 bugs). Like always, if you have any questions about technology or your wifi environment please feel to give us a ring at 781-679-0660 or via email. Does your office (or home) have desktops, laptops, tablets, smartphones, smart watches, cameras, personal assistance devices (e.g. Alexa), TV boxes, audio steaming systems, or any other Internet of Things (IoT) items connected to the wireless network? Now are any of them streaming 4K video from Netflix, running video games online, or listening to music? Each device connected to your network will take a slice of the bandwidth pie. If you are seeing performance issues try turning off the bandwidth eaters to see if there is any improvement. If so, time to purchase more speed from your Internet provider or manage your usage better. Is your office in the city or a commercial park? Do you live in an apartment? You may be experiencing too many overlapping wireless networks. If your network channel overlaps with other wireless networks then you may see slowness, network drops, and other issues randomly throughout the day. Go to the app store and install a wifi analyzer and see what your wireless environment looks like. If your network overlaps others log into your router or access point and move to a less busy channel and, if you have it available, use the 5GHz range instead of the 2.4GHz. Below is an example of a congested wireless environment. 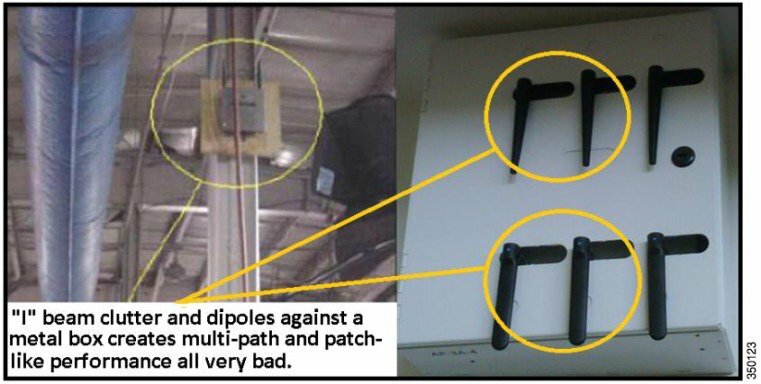 Here are some visual examples of poor placement of WAPs. To make your wireless signal better move your access point to better location (line of sight with the devices you are using) and make sure any external antennas are configured correctly. When was the last time you updated your Wireless Access Points? When was the last time your Internet provider replaced your wireless router? If is has been a while you may be using outdated wireless technology. If your access point says 802.11 (n , g, or b) and not 802.11ac then you have an older access point. If you are reading this article in 2018 then 802.11ax may be rolling out as the latest and greatest. You also want to make sure that if you are purchasing a new WAP that it has multiple antennas (external or internal). This may be shown as 2×2, 2:2, 3×3, 3:3 (the number is the amount of antennas). The more antennas the more pathways for your wireless devices to communicate as long as your devices supports it. Many laptops are 2×2 but phones may only be 1×1. One of the biggest annoyances when you travel is that the wireless signal in your hotel room is too weak (and probably insecure). Most rooms have a network jack but that is useless if you want to get online with your tablet or use the wifi on your phone to make calls to avoid roaming charges. It is also not very convenient if you want to get online anywhere else in your room besides the desk (e.g., your bed). Nano Wireless Routers are tiny devices that plug into a network jack and provide wireless access to a small area (e.g., your hotel room). They are only a few ounces and are smaller then a credit card. They can be powered by a standard wall outlet or from a USB port on a computer. The best part is that they are not expensive at all ($25-$50). If you would like more information on Nano Wireless Routers or how to keep your computers secure when traveling overseas please contact Wireguided.